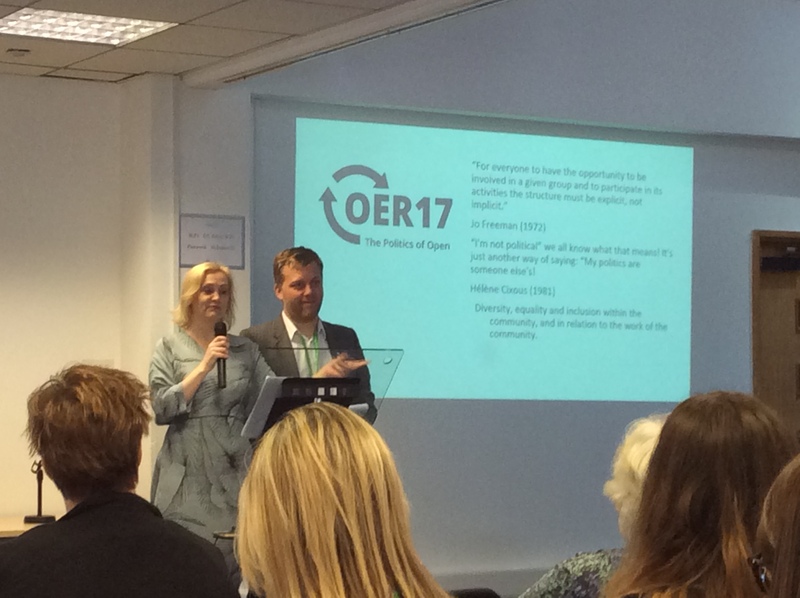 After spending time at OE Global in Cape Town, 4 weeks later I was attended the first day of OER17 in London, chaired by Josie Fraser and Alek Tarkowski, where I was fortunate to hear two great keynote speakers challenge our perceptions about open education. Maha Bali encouraged us to think about how OER might be viewed in situations where intellectual property of material is less relevant to teachers because of their country curriculum situation or where academic freedoms, taken for granted in many Western democracies, are not available to certain groups of society, particularly women. Or where access to the internet was limited or restricted, depending on ability to pay (access to the internet is never free). She pointed out the inequalities of treatment of internet users with some being more vulnerable to harassment, trolling or surveillance than others. In addition the interpretation of accessibility of materials came under scrutiny. Maha Bali asked the question about whether openly licenced works follow the letter but not the spirit of openness. She asked us to think about which of two options was more openly accessible: the use of complex academic language in an openly licenced article or material written in accessible language but carrying a more restrictive Creative Commons licence, such as no derivatives. She challenged us to think about the model of western funding for third world projects which did not explore the needs of the beneficiaries and impose solutions which subsequently don’t work or influence those seeking funding to conform to western ideas of what should work, without due regard for the cultural and contextual needs of their communities. Maha opened up her keynote to get live open educational practice stories from the audience, which meant the development of her keynote was not ‘complete’ until she was delivering it as she responded to each story and led into the next prepared idea seamlessly, therefore breaking the accepted view of a lecture being about delivering ideas in one direction of transmission rather than exchange, a demonstration of ‘open educational practice’ in action. 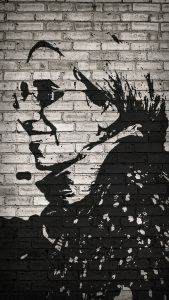 She also explored the birth of ideas and intentions (comparing them to seeds) and how they might be nurtured first in private (hidden deep inside) then emerge into the public when they were ready to be shared (make explicit) where nurturing would need to continue by all involved to reap the rewards. Later, in the second keynote, Diana Arce got us to think about the use of art as a tool for involving people in political activism. She took us through a thought-provoking and lively journey of how art in public spaces is used and interpreted taking into account who commissions it and the location in which it is placed. 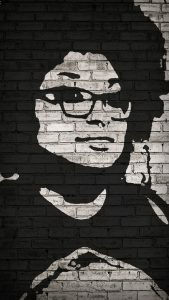 She showed how audience involvement in its creation was essential to empower people to understand, think and grow, offering them an alternative narrative via open spaces to share art and dialogue. The essential message was “don’t tell people what to think”, use art to help their ideas and contributions emerge. Open projects could use artists as strategists for development of open resources, going to where people are in order to engage them in the act of creation and knowledge building. After the first keynote at OER17, I attended a panel discussion called Perspectives on Open Education in a World of Brexit & Trump (#trexit), with panellists Maha Bali, Lorna Campbell (from Open Scotland), James Luke and Martin Weller. In addition to the four panellists, there were video recordings from 4 others who contributed real life examples of how these votes which have changed the global political landscape are affecting their academic practice, which the panel then discussed and opened to the floor for comments and questions. It was sobering to see how the laptop ban on flights from certain countries to the US and UK is seriously affecting the progress of a PhD student and had also negatively affected keynote presenter Maha who had travelled from Egypt without her laptop or presentation on a memory stick (she had put it into cloud storage online before travelling). The theme of the conference was very evident in this discussion, and it was clear that ‘Open is always political’. I also enjoyed the subsequent parallel session which included the OEPS presentation Exploring International Open Educational Practices presented by Beck Pitt, Bea De Los Arcos, and Michelle Reed in which they explored various definitions of OEP, some of the case studies and the emerging framework of open practice based on the research to date. This was followed by Catherine Cronin and Laura Czerniewicz’s Critical pragmatism and critical advocacy: Addressing the challenges of openness which explored how purist definitions of open can be a limitation to open practice, with pragmatism helping to address the challenges. Then Michelle Harrison and Irwin Devries presented Advocating for Open: the role of learning support professionals in changing practice, which reminded us that external online support networks are often the only source of support the lone open educational practitioner might have if their institution doesn’t have a policy or support mechanism for OER, and this has not changed much in the past two years, according to their research. From my perspective, the key messages which crossed both conferences showed that the awareness of OER, what it is, how it can be used, reused, and created is still in its infancy in many educational organisations, let alone in the third sector and there is much to do to make it and the practices which enable it to become more mainstream. A rallying cry at OE Global was for OER advocates to be more vigorous in actively marketing OER and OEP. This would help to balance the professional HE marketing of their online lectures/open textbooks/MOOCs which often drowns out really good community produced OER which may have better pedagogical value than a series of online video lectures not viewed in their original context. The thorny question of how to measure the impact of OER was also voiced at both conferences, though to a certain extent good practice surrounding this question is explored in Becoming an open educator. In addition, a strong message was that OER will not be adopted by learners and teachers if it is imposed, only if it is created collaboratively, The OEPS experience of collaborative open course production in partnership is one example of how this can work to the benefit of learners. Widening participation continues to be a strong theme of the OEPS project and will be discussed at the forthcoming Porous University seminar in May 2017. In both the OE Global and OER17 presentations I shared the questions we consider when we reflect on partnerships using open education: “if partners are looking to OER development as a way to fill structural holes in individual learning journeys, what are the implications for formal learning providers with a focus on widening participation? Does this mean that formal providers would have less of a role in widening participation if external organisations fill these holes or, more constructively, can formal providers see this as an opportunity to work more closely with external organisations to enhance their formal curriculum? By using OER created as a bridge to formal learning, learners can be provided with qualifications which directly relate to their career and lifelong learning opportunities?” (OEPS presentation extended narrative for OE Global 2017). In a world of #trexit and austerity budgets which are reducing public services including education, it is all the more vital for HE, FE and third sector organisations to work in collaboration to ensure that a good education is open to as many people as possible. Image credits: Josie Fraser and Alek Tarkowski welcome us to OER17, Beck Pitt presenting for OEPS at OER by Anna Page and licensed CC BY 2.0. Maha Bali and Diana Arce images by Josie Fraser for OER17. Attending a Higher Education conference is always unique to each person. There is always a lot going on and with presentations scheduled in parallel sessions it is impossible to attend everything or talk to everyone. 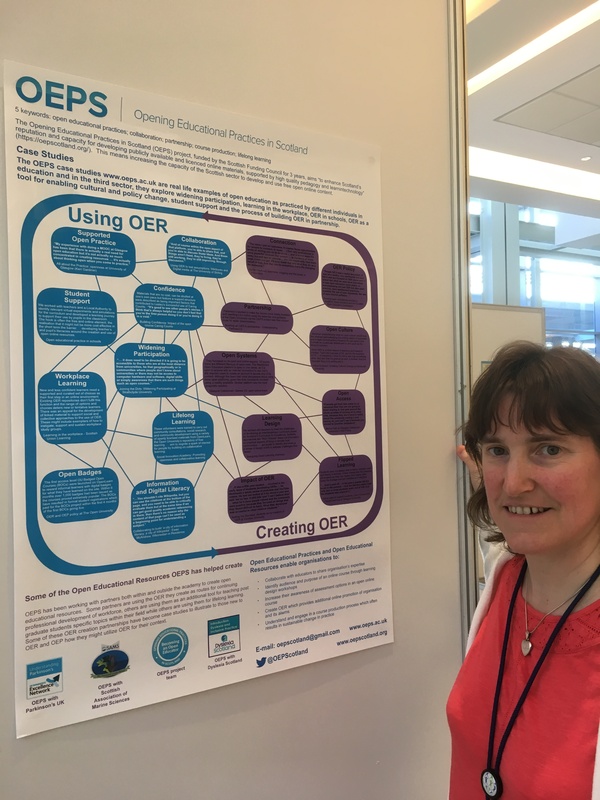 This year OEPS had a poster and a presentation at OE Global which for the first time was held in Cape Town and then a few weeks later had several presentations at OER17 in London. These are my reflections of attending both conferences. I was fortunate enough to present a poster and presentation for OEPS at the 3 day OE Global conference, hosted by the University of Cape Town and chaired by Dr Glenda Cox, in the mother city of South Africa. 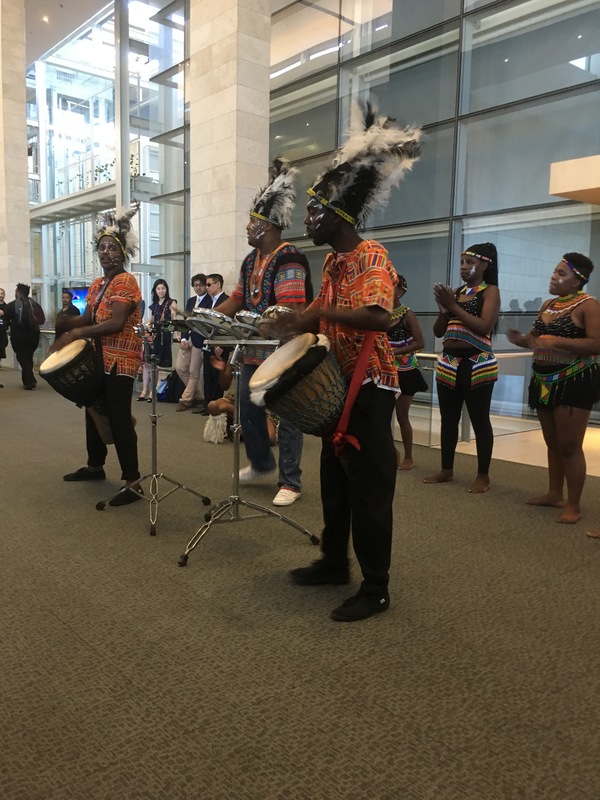 The conference was held in the city based international conference centre, rather than on campus which sits on the lower slopes of Devil’s Peak. OE Global is organised by the Open Education Consortium and has always been in the ‘global north’ so it was good that the open education researchers in the ‘global south’ were given the opportunity to host it and challenge ‘global north’ perspectives about open educational resources (OER) and open educational practice. I had not attended OE Global before so it was an enormous privilege to travel such a great distance to present on behalf of OEPS in the city of my birth. Everyone I spoke with at the conference was very engaged in open education and how it might be used to improve the educational opportunities of a wider group of learners. 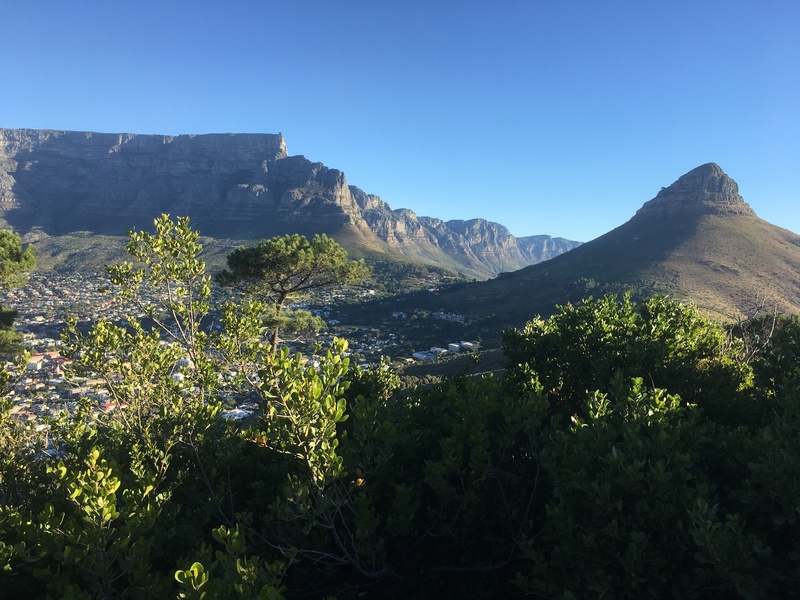 There was significant representation at OE Global by two overlapping groups – the ROER4D project, convened by UCT and the GO-GN researchers, convened by the OERHub based at The Open University. I attended several presentations by people from these groups, including a discussion about making use of MOOCs at UCT and another about understanding lecturer’s adoption of OER at three South African universities, postgraduate students as OER capacitators and exploring open educational practices of first year students at a SA university. I was interested in collaborative practices, so attended a presentation on teacher collaboration and practice (by Melissa King of BRIDGE, an NGO) which also explored the thorny question of measuring impact of OERs and one about teacher professional learning communities in India (this was a ROER4D sub project). I was fascinated by the experience of an OER creation novice, Professor Jasmine Roberts from the USA, who discussed the impact of authoring OER on student engagement, learning and retention when she authored an open textbook for her students because the existing textbooks didn’t cover what they needed for their class. Early in her presentation she identified key reasons why more teachers are not using or creating OER: This is the same issue that Josie Fraser and others discussed at the OEPS forum 4 last year and is a challenge common to both ‘global north’ and ‘global south’ educators. Some of us in the session were able to point Jasmine to online resources which offer such advice and support, such as OEPS Becoming an open educator and How to make an open online course OERs on OpenLearn Create. However it was also clear from her experience that supportive open educational practice networks to help with answering specific questions about OER creation can help give OER creation novices the confidence to make a good start or to avoid some of the pitfalls along the way. It was encouraging to learn that the open textbook she offered her learners for free was well received, proved accessible to the learners and had a positive impact on their learning and enjoyment of the class. The issues about making the work of researchers in the global south more visible and discoverable was explored by a presentation about the ROER4D curation and dissemination strategy. This strategy aims to make content open by default when it is legally and ethically possible to do so, especially if this increases its value to learning. I liked the fact that in the reasons why it was necessary to have such a strategy, all the arguments for good academic practice were cited as also good open educational practice. This was approached in a way to make it attractive to an academic to implement. The poster sessions were in the coffee breaks and I was able to discuss the poster with several people as well as hand out OEPS leaflets, stickers and OpenLearn pens! My presentation was on the last day in the final session before the closing plenary. It was encouraging to have an interested audience and some good questions about what OEPS has been doing with opening up practice on participatory course production. Beck Pitt, OEPS Researcher, live broadcast the presentation via Twitter Periscope. After the closing plenary panel it was time for goodbyes as everyone dispersed back around the globe after taking in some of the sights of Cape Town. Part 2 covers OER17 in London and my reflections on comparing the themes of the two conferences. Image credits: Cape Town Convention Centre, OE Global Gala Dinner, View of Table Mountain and Lions Head and Anna by the OEPS Poster by Beck Pitt and licensed CC BY 2.0. Following hot on the heels of the OE Global conference in Cape Town is the OER17 conference in London. This year the conference theme is ‘The Politics of Open’. OEPS has two presentations in the same parallel session period in different rooms. One is by Ronald Macintyre and Pete Cannell (presented by Ronald) called ‘Mind the Gap: Structural Holes, Open Educational Practices and the Third Sector’. 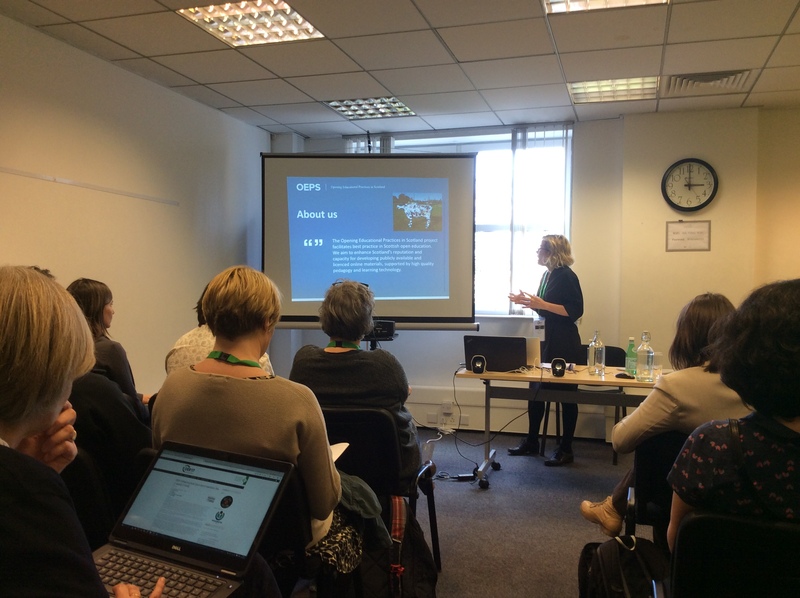 The other OEPS by Anna Page is called ‘From OER to OEP – enabling open educational practices via platform development and open course building exemplars’. OEPS researchers, Beck and Bea are also presenting on Wednesday in a later session. They are presenting on ‘Exploring international open educational practices’. There is also a presentation from Gill Ryan from the Open University in Scotland (where OEPS is hosted). Her presentation is called ‘Open Learning Champions: a model for widening participation’. Review examples of OEP in the Scottish context. Recontextualise these examples and examine them within the international context, through the use of exemplar case studies from around the world. Present an emerging framework of open practice based on their research to date. In doing this they aim to further develop a definition of OEP through a systematic analysis of international open practices. 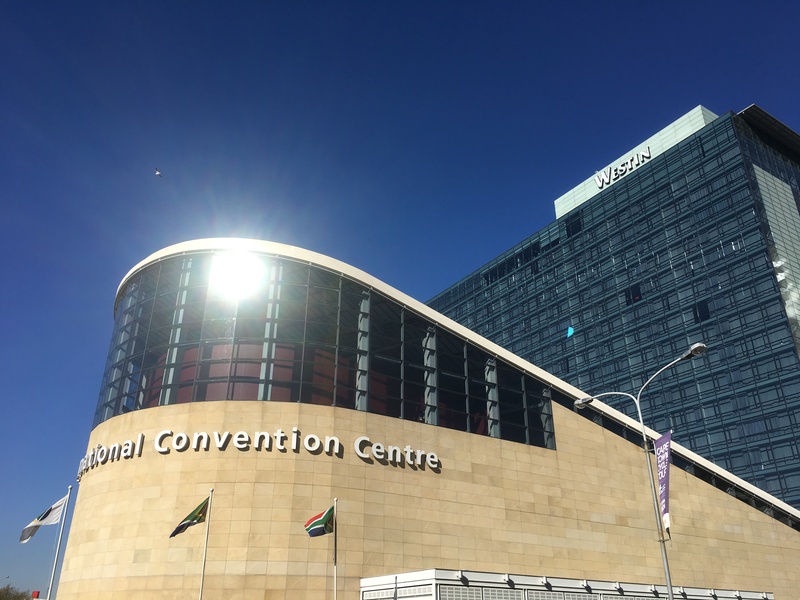 Today, 10 March, is the OEPS project presentation at the Open Education Global Conference in Cape Town. Anna Page is presenting for the OEPS project. The presentation is all about our experiences of working with partners in producing open online courses and resources as we aim to open practice on participatory course production and share what we have learned. How can open educational practices be used to enable more learners to benefit from specialist knowledge online in accessible, engaging ways? Opening Educational Practices Project (OEPS) is collaborating with external partners to develop course creation skills they need to deliver their first free, open online courses. OEPS explores how OER can support people distanced from education by applying ‘what works’ in widening participation to OER (Cannell et al 2015). Courses are co-created through a participative learning design process focusing on learner needs and context. By contributing their practice-based knowledge partners develop confidence and skills for future initiatives (Macintyre 2015). Existing OER may not suit their context as they create online courses for workforce development and lifelong learning. This became a two way learning process for both partners and OEPS. Moving from focussing purely on learning design to learning through and for doing (Kemmis 2010) we reconceptualise what creating content in partnership means for OER production and practice. In parallel we collaborated to create OER about open educational practices and OER. While learning through doing we have questioned roles and responsibilities, what existing production processes at The Open University needed amendment and how technologies for OER hosting can support partner and learner needs. This presentation will share experiences of partnership collaboration and models for OER production emerging from this collaborative process which may be adapted by others. It will also show impact evaluation of OER created including the OEPS course and how methods of OER creation have evolved as a result. Last year on International Women’s Day we brought you a roundup of some of the wonderful women in OER. This year we thought we’d keep things a bit closer to home and tell you what OEPS is doing to #BeBoldforChange on gender equality. In the last year we’ve had the privilege to work with more wonderful women. For example our first OER on Understanding Parkinson’s was led by the Claire Hewitt from Parkinson’s UK. She is now a champion for open education in her organisation and the wider third sector. How to make an open online course was written by the OU Free Learning team lead by Patrina Law with contributions from Anna Page and OEPS; and Becoming an open educator was developed by the OEPS team, lead by Beck Pitt (not to brag but we were pretty pleased when this course received an honourable mention at the recent Open Education Global awards). and also has a poster on the OEPS Hub (www.oeps.ac.uk) and good practice case studies. Beck and Bea will also be participating in a number of ways. Follow us on twitter (@OEPScotland) to hear their reflections on open education and gender issues at the conference. They will also be at OER17 conference in early April. This is also showcasing some fantastic keynotes and plenaries with women. Indeed the conference theme ‘The politics of open’ is a rallying cry for gender equality and social justice. Beck, Bea and colleague Martin Weller, will be presenting a paper on the international context of open educational practice as it relates to Scotland; and Anna will be presenting a paper on the development of OpenLearn Create, drawing on the experiences of OEPS co-production of courses hosted on it. So what will OEPS do to #BeBoldForChange? We will encourage more girls into STEM education and careers. We are working with the Equality Challenge Unit to produce an open educational resource (OER) that will support the development of STEM capital in education. This course is particularly focused on gender equality and how to address conscious and unconscious gender bias. We hope that this will support teachers to challenge gender bias and also to develop STEM capital. We will continue to promote open education as a means to break down barriers to education, widen participation and to facilitate women’s access to education. For example open educational resources cover a wide range of subjects, and can be accessed at a time and place that suits the learner. What will you do to #BeBoldForChange?